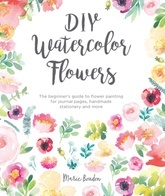 Learn to paint lovely watercolor flowers in simple steps with this free and easy approach to watercolor painting for beginners. This beautifully presented creative course will give you a good grounding in this medium and teach you all you need to know to get started with painting flowers in watercolor. Find out about supplies, color mixing, wet and dry techniques, blending and gradients, contrast and even how to digitize your work. Then learn to paint roses, peonies, carnations, dahlias, anemones, poppies, details and textures and how to bring all of these together into beautiful compositions which make lovely art pieces, journal pages, handmade stationery and greetings cards, inspirational quote frames, personalized gifts and more.